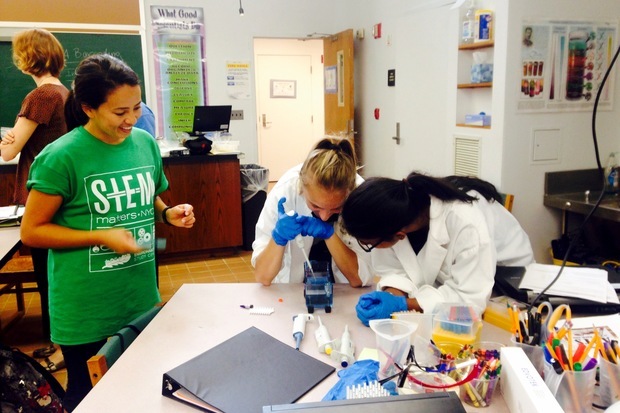 Students from Forest Hills High School work on extracting DNA during the Urban Barcode Project. Forest Hills is one of the areas with the top on-time graduation rates, according to a study from Measure of America. MANHATTAN — Despite New York City’s choice system for high school admissions, the neighborhood where you live may still dictate your child’s chance of graduating on time — regardless of where they attend — according to a study released Wednesday from the nonpartisan initiative Measure of America. To apply for high school, eighth graders can rank up to 12 programs out of 700 schools, a choice process implemented more than a decade ago in efforts to weaken the well-known link between neighborhood and school quality. But families don’t necessarily have an equal playing field when it comes to how they make those choices and how they navigate the complicated admissions system. So, where you live is still still highly associated with whether your child will graduate on time, the study found. In fact, disparities in on-time graduation rates by neighborhood are greater than disparities by race, the report found, with 34 percentage points separating the best-performing community district and the lowest performer. A table from the Measure of America study on New York City graduation rates. “The [choice system] has no doubt benefited some children,” said Sarah Burd-Sharps, co-director, Measure of America, an initiative of the Social Science Research Council that looks at data concerning people’s well-being and opportunity. “But the system really assumes that all kids have adults in their lives with the time, language skills, social networks, and financial resources required to navigate this bewildering process,” Burd-Sharps said. Many do not have such resources, she said. It takes an overwhelming amount of time to identify and apply to an eighth grader’s dozen choices. It's a process that involves pouring through the 500-plus pages of the high school directory; attending high school fairs, tours, open houses and interviews; prepping for and taking special exams; developing portfolios; and preparing and performing auditions. The report estimates the admissions process takes a bare minimum of 25 hours for filling out applications and visiting a handful of nearby schools to upwards of 72 hours. “Competition in this arena is a blood sport, and successful admission to the best selective high schools requires focus, contacts, money, time, flexibility, transportation, extreme attention to detail and the ability to prioritize the school admissions process over work or family obligations,” the report notes. “In all of these areas the privileged have a significant advantage over others, especially poor families and immigrant families." It’s especially difficult for hourly workers who lose wages when they take time off and families who live far from their children’s interested schools. 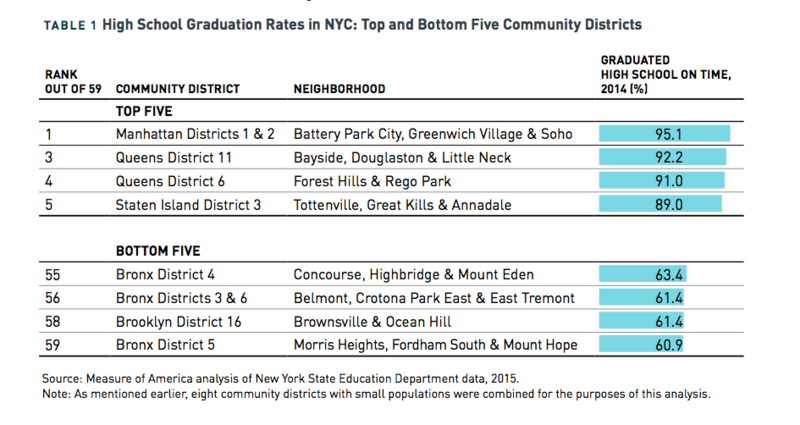 See the graduation rates for New York City's community districts, according to the Measure of America study. Department of Education officials said they’ve partnered with researchers and experts to better understand the struggles high-needs students face during the admissions process, and for instance, are sending high school directors to all family homeless shelters this spring. The DOE also piloted a targeted admissions support center at the Citywide High School Fair and Bronx Borough Fair to provide individualized support and counseling to students in temporary housing. But even students who travel to schools outside their neighborhood bring with them their “cumulative” advantages or disadvantages, the report noted. Many of the kids in these areas attended elementary schools with less experienced teachers and have parents with more limited education, the report said. They may suffer from poor health, stress from economic insecurity and greater exposure to trauma. They might be hungry or unable to read well because they need glasses or feel distracted because of an untreated toothache. Also, students from low-income neighborhoods who do travel to high schools in other neighborhoods, Burd-Sharps, noted, often end up spending hours on the subway simply to go to another low-income neighborhood. To fix the system in the long term, the DOE should ensure there are more good high school options across the city to chose from, she noted. In the short term, the researchers are calling on the DOE to add more guidance counselors to reduce their caseloads. They also hope the department uses this data as a baseline in setting a goal to slash the gap in graduation rates by neighborhood. Noah Gotbaum, a member of the Upper West Side’s Community Education Council and a parent of a ninth grader, has long criticized the admissions process for favoring those who can put in the time and money to do the school visits and other work needed. “The amount of time one has to put in to even begin to understand the process much less to navigate it is crazy. I’m familiar with the school system, but I was not prepared for what I had to go through to understand how to navigate it — apart from the sheer number of choices, to figure out how to play it in terms of where you might get in,” he said. On top of that, he believes the process hurts kids’ learning in eighth grade since so much time is spent touring schools during the school day and prepping for high school admissions tests.